Update: Attached are some pix of Hannah (and her Saluki friends) over the past couple of months. She continues to do extremely well and has made so much progress coming out of her shell. If she knows you and trusts you, she is sometimes TOO friendly! (well, not to me, but to others who aren’t as thrilled with a 63 pound lap dog!) She is even finally starting to like going for walks (she was very reluctant to leave the house for several months, so walking her always involved much coaxing, but now she goes, and while not necessarily willingly, she doesn’t put up any resistance like before.) We take very long (6+ miles) walks with the salukis every weekend, in additional to daily walks of two miles or so, so she’s staying in great shape. She’s a champion eater, and tap dances for her dinner. Her lips-curled-back, toothy smile is tough to catch on camera – but she smiles with the best of them. I’ve actually only had one other dog that did that. The strangest thing about her is how quiet she is! She rarely makes any sound at all – no whining, no barking. She is an absolute joy to be around and I love her to pieces. Dixie, my greyhound with lymphoma, is now failing, and if I didn’t have Hannah around to make me laugh, I’m not sure what I’d do. Rozah (now called Hannah) is a 2 to 3 year old spayed petite female who is heart worm negative, current on all vaccinations and is microchipped. Rozah is shy at first but loves to play, she is very sweet when she warms up to you. 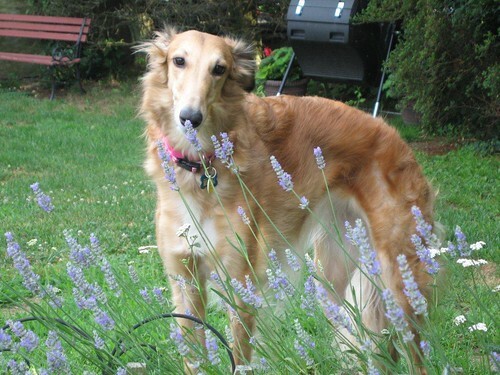 Rozah gets along well with other borzoi but it is unknown if she is small dog or cat safe. Hannah is starting to settle in very well. Her lead work has improved tremendously and she's even going up and down the stairs now. She's also small animal safe, so far. That might change as she gets more comfortable, but I would be surprised. Rozah is from Pickle Hill. July 2011 Update: Rozah, renamed Hannah, is doing wonderful in her new home with Mary Campangolo and obviously has plenty of time to stop and smell the flowers!